Among the shows I watch is Tekzilla, Revision3’s follow on to InDigital. Tekzilla is a weekly show aimed from beginners to intermediates with topics spanning all areas of technology. Besides gadgets, CE devices, computers and software, they’ve covered other things too like the 50th anniversary of Sputnik and visited the Exploratorium but with just three shows under their belt it’s hard to say what are the limits of their coverage. So far I’m thinking I liked InDigital a bit more but maybe I’m still a bit miffed that it was pulled not long after I started regularly watching it. 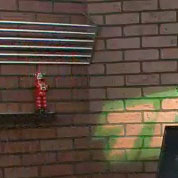 Anyways, they’re still working on their temporary set and this week they adorned the fake brick backdrops with shelves holding little items including a little red Robby the Robot tin toy. Not much to see but it’s always good to see something of Robby. Previous Previous post: Panda! Go Panda!